I’m finishing up another week of speaking at a camp; this time in my beautiful home state of WA! It’s nice to not have to go “over there” to share the best news ever. Sometimes “over there” is a lot of fun, but I’ll tell you, it’s a lot of fun to be sharing with teens right now who get to share “right here” with their friends and family! In a few short weeks, teens will be heading back to their “mission” on their campus, at their clubs, building into their community and probably participating in the new programs at their church… I am praying RIGHT NOW for this mission. However, I am not just praying, I am doing my part to actively train them (and I hope even more importantly, participating with them by pursuing any opportunity I have to share the good news too)! If you are in the Northwest, I’d love to have you participate with me in a training event we have at Youthmark. It’s not just a training event, it’s a concert and also will have a time of wonderful worship through song! My friends, Everfound, will be there as well as soon-to-be-friends, Kye-Kye! I can’t wait. 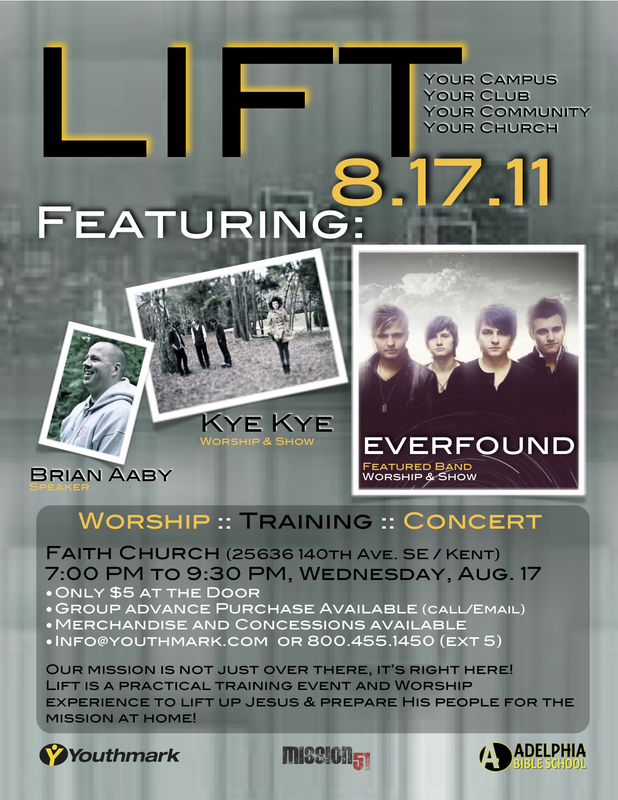 LIFT takes place in just one week (Wednesday, August 17, 7:00 PM) at Faith Church in Kent. It’s only $5!